Madge says she might have to leave the bar because she can't fit her shifts around her Council work. She wants a new barman as someone left last week, Eddie volunteers himself, Madge isn't sure but he has experience so she agrees to speak to Paul. Eddie and Harold play darts. Derek has gone into an Ambulance, he has had a heart attack and is unconscious, they are going to the hospital, Helen feels guilty about taking him out and leaving him on his own. Beverly reassures her that it wasn't her fault. Caroline has ordered a computer program that will make doing work easier, Paul says it's too expensive and she must send it back for a refund. Caroline says she is the manager so she can decide; Paul disagrees and says he should be consulted before any money is spent, he leaves for the day and Caroline installs the program anyway! Eddie has found Danny and Shane's old dart board so Harold can practice darts; he isn't keen because it isn't educational! Sharon comes out, she is packing and tells an unhappy Madge that there are a number of phone messages for her; she is going to ignore them for tonight. Harold then throws a bullseye! Beverly tells Helen that Derek is dead, Diane (Derek's Daughter) arrives and has a go at Helen for taking him out. 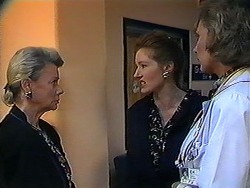 Beverly offers to stay but Helen declines the offer, Beverly tells Helen that Diane will calm down. Madge and Sharon come in, Sharon has come to say goodbye, they hug and she leaves as does Beverly. Madge tells Helen she has invited Felicity Brent over for dinner; she is the only other female councillor and a social butterfly according to Helen who tells Madge about Derek. Helen tells Madge that she and Derek could have become more than good friends, she breaks down crying in Madge's arms. Sharon is leaving and says bye to Harold and Madge, Eddie is driving her to the airport, Sharon starts to cry as Madge brings out a guitar for Henry and everyone wants her to say “hello” to Bronwyn for them, they all hug and Sharon leaves. 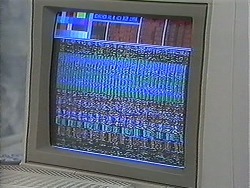 Caroline is having a problem with the computer, she can't find some files. Diane arrives and tells Helen that Derek's funeral is tomorrow but she can't attend, she isn't welcome. Diane says that Helen only wanted to know Derek because of his money; she spots the painting that Derek gave Helen and says she will contest the will. Helen hands her the painting and says she will fight her all the way! Eddie returns from the airport, Madge is hassling Harold for some money, she wants to buy a new dress. 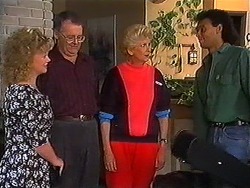 Madge starts to moan about Eddie not leaving but he overhears in the kitchen. 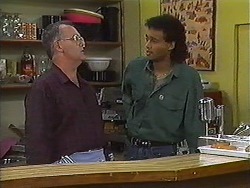 Madge asks Paul about the barman's job and he agrees to let Eddie have it and he moans about computers again as Caroline still can't find the files she needs. A PC repair man is looking at the computer, he asks if any new programs have been installed, Paul says there hasn't and Caroline looks guilty but doesn't say anything. The repair man thinks it's a virus but isn't sure and can't come back to next week. Paul isn't happy but the repair man says as no software has been installed he's unsure what the exact problem is; Caroline begins to look even guiltier!